Ever wondered how to use the brush tool in Photoshop Elements? This tutorial will teach you how! 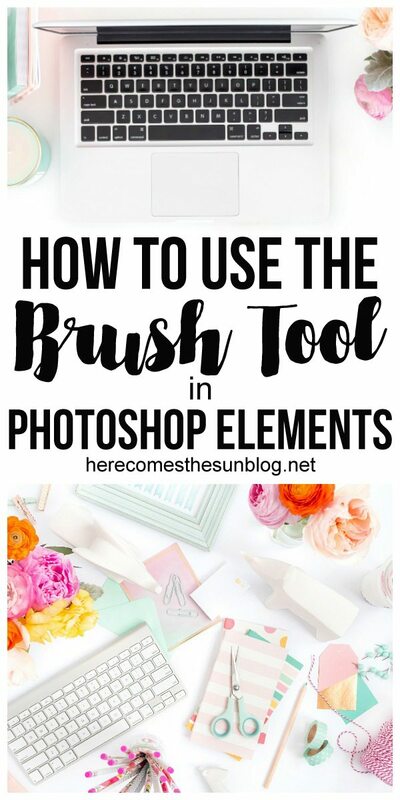 Today I’m going to show you how to use one of my favorite tools in Photoshop Elements … the brush tool. The brush tool is right on up there with the clipping mask as one of my favorite functions. The brush tool allows you to paint on a picture or image in a specified color and shape. Brushes come in just about every shape imaginable and are very easy to use. The brush tool is located on the left side of the screen. It looks like the paintbrush. 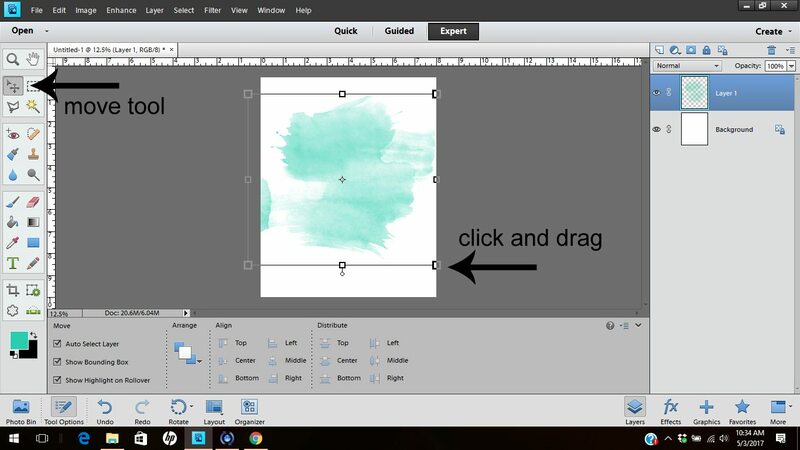 Photoshop Elements comes loaded with several default brushes but you can also download free brushes or purchase them online at Creative Market or Design Cuts. I’m using a watercolor brush. If you learn better via video, there is a video at the bottom of the post. First, you’ll need a blank document. I chose to make an 8×10. Next, you’ll want to create a new layer for your brush work. (The layer isn’t shown in the screenshot below…oops). 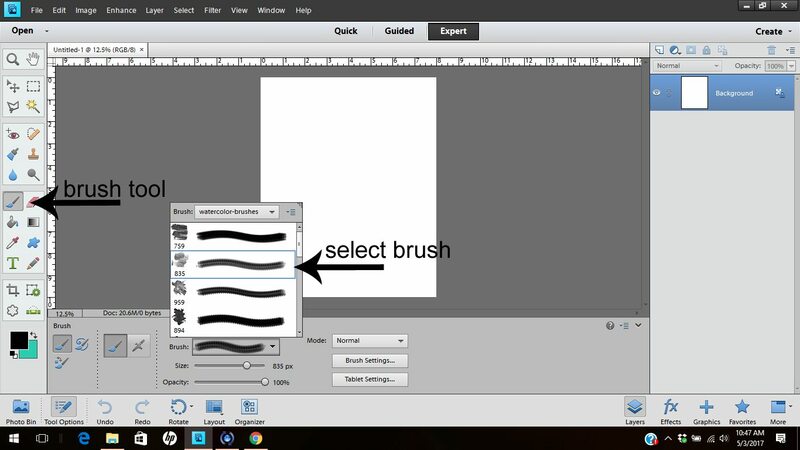 Once you have added a layer, click on the brush tool and use the drop down menu to select the brush that you want to use. In this example, I am using watercolor brush number 835. You can change the size and opacity of the brush using the slider. You can also change the brush color with the color picker. When you are ready to brush, just position your cursor over your document and click. It’s that easy! 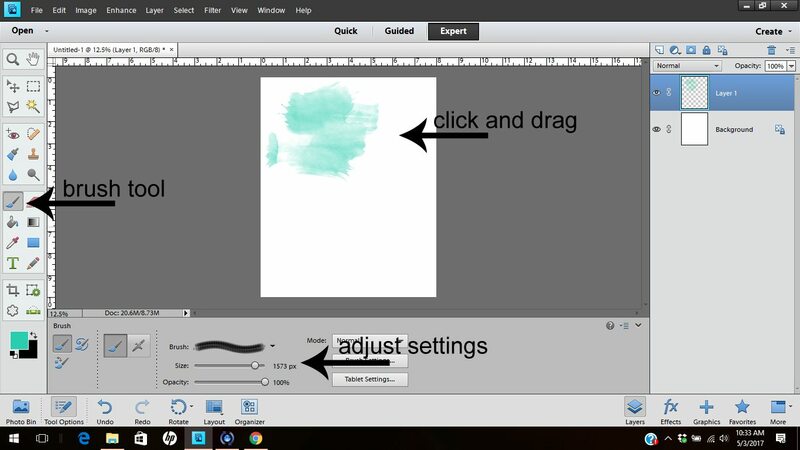 Some brushes require only one click and some require a click and drag. It all depends on the type of brush that you are using and the effect that you want to achieve. If you decide later that you want your brush to be larger, you can click on the move tool and resize the brush. One way that I use watercolor brushes is to create backgrounds for my hand lettered prints and invitations. Here is an example of this in action. 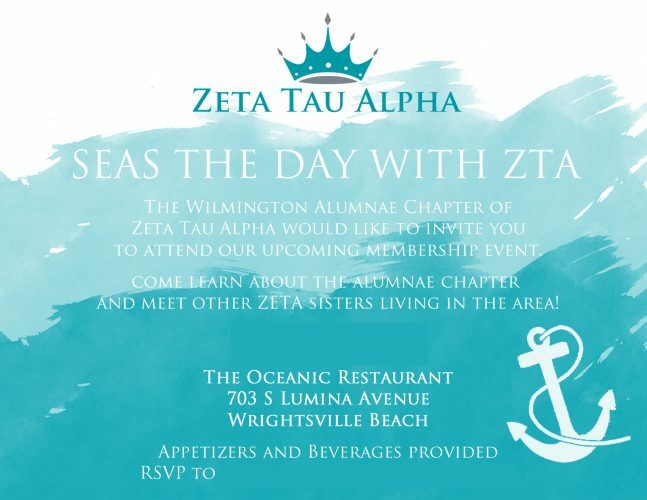 I used a watercolor brush to create the waves on this invite for my friend’s sorority function. I used the same brush but altered the opacity for each wave. The date and contact info have been edited out for privacy. Be sure to check out the other 5 Photoshop tools that I can’t live without and click here to see all my Photoshop Elements tutorials.